This first weekend in March was filled with sunshine in this corner of North Wales. Joined by long-time sailing and diving buddy, John Kingsley, motoring down the estuary was a lovely beginning to the day. 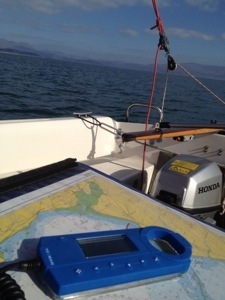 We were heading down the bay along Morfa Harlech to Shell Island. Our aim was to catch the high tide and nose up the creek. However, the breeze had other ideas and after spending some time bobbing on a flat calm sea, we we forced to start the engine and motor. 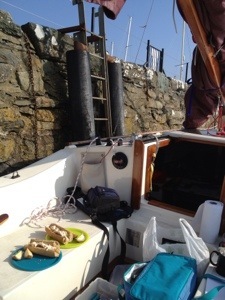 However, there was still enough water to follow the withies to Pensarn and moor at the stone quay for lunch. With a falling tide, it could not be a long stop, and we were soon motoring back down to the narrow mouth. 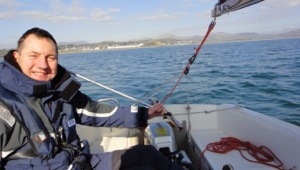 The wind was still little more than a few gusts, so more motoring was called for, though it was very pleasant drifting in the sun. 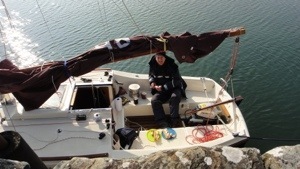 However, the wind filled in eventually and we were having a lovely close reach on genoa, staysail and mainsail. However, this was sadly short lived as, without warning, the turning block for the two main halyards parted company from the deck! Not as dramatic as I would have thought, but the boom settled pretty quickly on the gunwale. The main was quickly flaked and the rest of the approach completed on genoa. Not even this addition to the to-do list could dampen enjoyment of such a good day on the water. All last season, I struggled with Aurora’s main sheet arrangement. This had a tendency to tangle up, snag when gybing and generally fail to pay out. The fact that the cleat is on one side made things tricky on a port tack. Therefore, I fitted a strop between the two transom fittings with the block travelling on a pulley. This arrangement seems to work well. A new acquisition for this season is a yeoman sport plotter. I’d fancied getting one of these, as soon as I heard of them. Although I love gadgets, and have a plotter app, I also love charts and enjoy browsing through them. So a yeoman plotter, which allows accurate position fixing (and much else besides) on standard charts seemed like a no-brainer. Also has the benefit of being a backup if the power goes down. 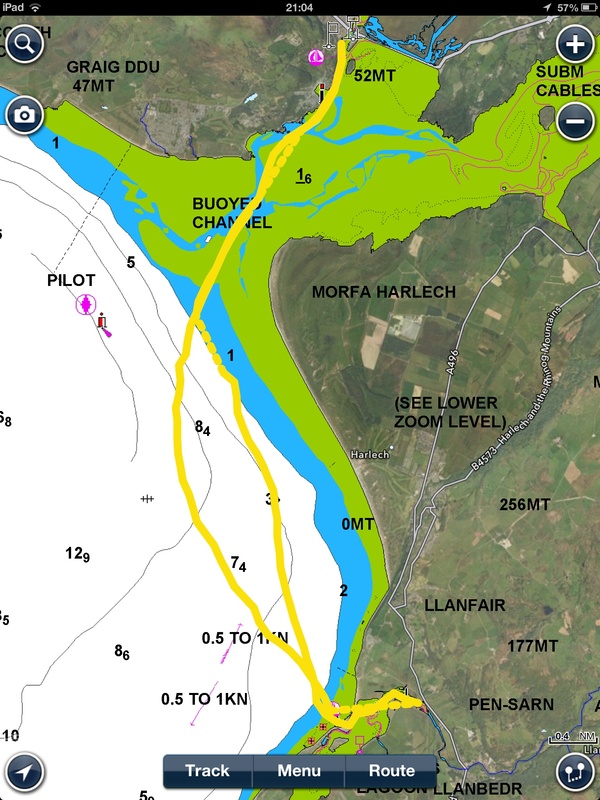 A quick shakedown cruise around Tremadog Bay was enough to show both changes are worthy improvements to Aurora.